This research line will try to understand the heat source nature of different geothermal systems and the mechanisms of heat transfer to the environment and its influence on the circulation of hydrothermal fluids. How long magma-derived heat sources can survive to sustain geothermal systems? How mechanisms of heat and mass transfer to the country rocks operate? Geothermal fluids are the mode of transport for the deep heat of Earth to the surface; these fluids may be from an aqueous, liquid or gas origin. 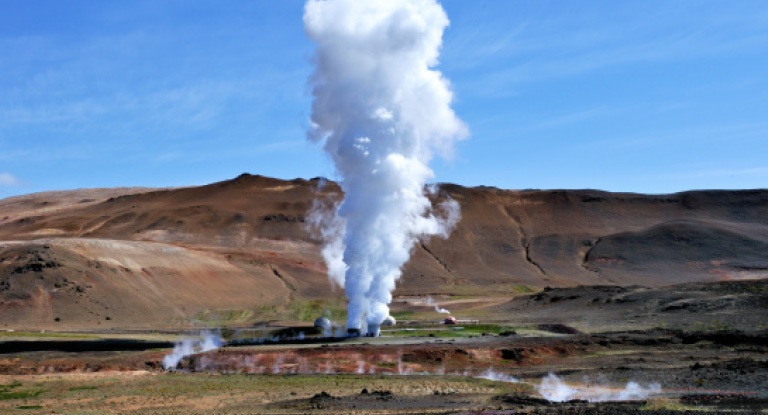 To make the most of the fluid potential, geothermal power plants should be tailored to the characteristics of the reservoir, the temperature and the fluid’s physical state (liquid or steam). The study of the geochemistry of these fluids allows tracing its origin and evolution in order to establish a reservoir model. At the same time, it contributes to estimate the reservoir’s geothermal potential and to establish other factors relevant to the operation of the power plant, for instance, to determine the mineral precipitation in pipes, among others. Research projects in active and fossil geothermal systems. Applied research projects with direct impacts on exploration and exploitation of geothermal fluids. This research line will study the effects of hot fluids that reside or flow through an area of rock that becomes highly altered as a result. Hydrothermal alteration can be widespread in a volcanic setting because the input of heat and fluids from the volcanoes. The main objectives of this research line are to better constrain the physico-chemical conditions of high- to low-temperature fluid-rock interaction in geothermal fields, by investigating the stability of alteration minerals together with the kinetic constraints of reactions (e.g. varying fluid conditions, duration of heating, the effect of rock strain, etc.). This research line will focus on mineral alteration in active and fossil geothermal systems using X-ray diffraction (XRD), Fourier transform infrared (FTIR) spectrometry, scanning and transmission electron microscopy (SEM and HR-TEM) and chemical microanalysis (EDX and EMPA). Chemical (elemental and isotopic) mobility associated with heat-waterrock interactions will also be studied. This research line will aim to delineate the late Cenozoic three-dimensional geometry and strain fields, elucidate relations between faults, stratigraphic features, and thermal aquifers, and constrain stress orientations. A comprehensive analysis of the Chilean Andes has significant potential for characterizing both the structural setting (strain and stress fields) and structural controls on geothermal reservoirs. The structural and geophysical observations and interpretations elucidated by these studies will serve, in conjunction with results from the other Research Lines, to define geothermal reservoir models that will result in improved exploration guidelines for new sources of geothermal energy in Chile and the Andean Cordillera. One of the most important elements of geothermal energy systems is the presence of suitable aquifers in contact with geothermal heat sources. Consequently, establishing the nature of rocks that could be acting as reservoirs in geothermal systems will be one of the main scientific goals to develop during the second period. Identify potential reservoirs in exploration areas or geothermal systems. Define the basement influence on the reservoir characteristics. Investigate the interaction between reservoirs and surface drainage systems. Develop numerical models to implement geothermal energy under different use conditions. The final goal of this research line will be the construction of 3D models using all available geological, geophysical and geochemical data as a way to a better understand the whole geothermal system in 3D. CEGA seeks to provide scientific background to model geothermal systems in the Andes mountain rage. We aim to develop interdisciplinary projects, increasing the collaborative work between the Centre and other academic and public institutions, as well as industry. CEGA currently develops some specific hight-enthalpy (temperatures above 150˚C) and low-enthalpy geothermal projects (temperatures lower than 90ºC). Although high enthalpy systems are the most interesting to produce electricity, there are a whole series of initiatives of geothermal direct use (district heating, greenhouses, aquiculture, timber industry, etc) that improve quality of life of citizens and the main productive sectors of Chile. This project seeks to understand the behavior of the Cerro Pabellón geothermal system, the first South American geothermal power plant. For this purpose, a study of the rhyolitic domes will be executed, in order to understand the nature of the heat source that will feed the power plant. This investigation is part of a bigger project that includes other geothermal systems located in northern Chile. In this research CEGA will work with the University of Urbino (Italy) and Enel Green Power, who owns Cerro Pabellón project. The initiative aims to boost production and sustainable consumption in isolated areas of the country, specifically in the South of Chile. For this purpose, a geothermal firewood dryer and a greenhouse will be constructed. Both systems seek to generate a positive impact on the environment and local economy. The firewood dryer construction will provide clean and sustainable solutions to communities with elevated energy demand in an area of high air pollution, where firewood is the most popular choice for home heating. Additionally, the implementation of the greenhouse aims to contribute to consumers and local farmers, who currently depend on the import of agricultural products, especially in winter. The initiative brings together researchers from the Energy Centre (CER) and the Andean Geothermal Centre of Excellence (CEGA), both housed in the School of Physical and Mathematical Sciences (FCFM) of the University of Chile. The project is funded by the “10YFP Trust Fund” of the United Nations Environment Programme. During 2012 and 2013, CEGA and the Department of Geology of the University of Chile, assessed the geothermal potential in the Santiago and Talca basins, both high energy-demand areas. This research was funded by the Ministry of Energy (Chile). The main goal of this project was to determine thermal parameters such as heat flow, geothermal gradient, and wells thermal conductivity, existing in the Santiago and Talca basins. Also, define areas with thermal anomalies in their subsoil. The analysis allowed to determine that most favorable areas for using this type of energy, are where the static level is less deep. In both basins, the most favorable zone are located towards the west sector, where the maximum drilling of about 120mt is required. Desarrollar proyectos aplicados, estudios y herramientas de investigación asociadas a la efectiva integración de dimensiones sociales y culturales que interactúan en el uso de geotermia.